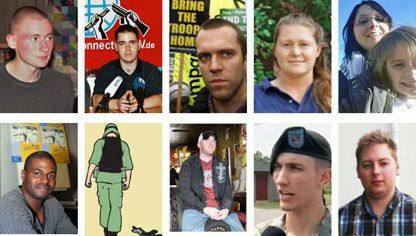 USA: Afghanistan war resister Travis Bishop is free! (31.03.2010) (31.03.2010) Afghanistan war resister Travis Bishop was finally released from the brig at Fort Lewis last week. Travis originally was sentenced to 12 months in prison in a court-martial at Fort Hood, Texas for refusing to deploy to Afghanistan for reasons of conscience. He later received a 3 month reduction in sentence due to a successful clemency application to the Commanding General at Fort Hood, as well as receiving extra time off for good behavior. He served a total of 7 months and 12 days of confinement, as well as a reduction of rank from Sergeant to Private and a pending Bad Conduct Discharge. While in the brig, Travis Bishop was recognized by Amnesty International as a prisoner of conscience and wrote a blog from jail. He also received support from hundreds of people from around the world who wrote both letters of encouragement to him but also to military authorities calling for his release. Bishop also spoke out about the bad conditions at the Fort Lewis brig, which resulted in some reforms at the facility as well as Travis being placed on the facility’s "most difficult" prisoners list.